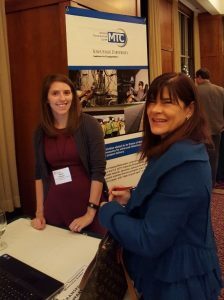 On December 7-8, 2015, Shauna Hallmark and Nicole Oneyear represented the Midwest Transportation Center (MTC) at the Midwest Transportation Workforce Summit in Madison, Wisconsin. The event was attended by public and private sector stakeholders in transportation, education, economic development, and other areas seeking to work together to enhance transportation workforce recruitment and development. The MTC hosted a booth showcasing several K-12 initiatives at Iowa State University, including its popular Go! e-zine and new summer teaching and leadership workshops for high school teachers and students. This summit was sponsored by the Midwest Transportation Workforce Center (MTWC), one of five regional surface transportation workforce centers funded by the U.S. DOT and the Federal Highway Administration, which serves Illinois, Indiana, Iowa, Kansas, Michigan, Minnesota, Missouri, Ohio, and Wisconsin. The MTC is a member of the MTWC.